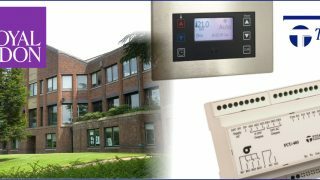 A new building management system for Hope & Caergwrle’s new state of the art Primary Care Centre featuring Trend Controls and Synapsys Modbus Integration. A unique control strategy was developed to meet the objectives set out within the specification providing monitoring and control that is energy efficiency and a comfortable building for it’s occupiers and visitors. Bespoke Trend Web embedded BMS system graphics were created allowing user modifications and interrogation of the BMS from any PC on the site network. A Synapsys Modbus Interface was installed and configured to allow monitoring and control of Modbus field devices such as the electric meters and heat recovery units. The Synapsys unit allows the Trend BMS to monitor and control the devices through the interface unit. 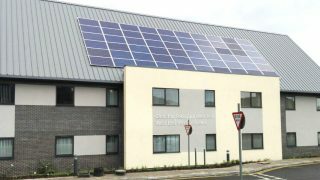 Nyke Energy were commissioned by Larewood Complete Building Services working in conjunction with Castlemead Group and Betsi Cadwaladr University Health Board to supply, install and commission a comprehensive building management system at the new Primary Care Facility in Hope, North Wales. The new Primary Care Centre serves the communities of Hope and Caergwrle and provides much needed combined health services to the two historic Welsh villages sitting side by side. The existing high street surgeries occupy buildings of residential scale with limited scope for expansion. Health facilities were cramped and unsuited to modern accessibility requirements. The new health centre, as well as providing new accommodation for the existing Hope Family Medical Centre, will provide consulting rooms and administration facilities for Betsi Cadwaladr University Health Board. Nyke Energy were employed to supply, install and commission a new Building Management System to control the heating and ventilation at the new facility. Design Trend Web Embeddded Graphics to allow control and interrogation of the BMS system from any PC on the building intranet. 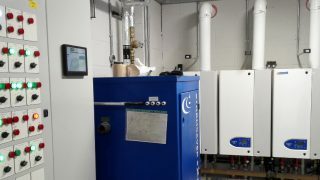 Nyke Energy were employed to install a new Trend building management system to monitor and control the various items of plant throughout the new Primary Care Facility. A BMS control panel was manufactured in house and installed onsite by our team of BMS installation engineers. Control panels were equipped with the brand new range of Trend IQ4E controllers offering the latest technology to effective monitor and control all heating and ventilation equipment across the site. The control panel housed in the main boiler house plant room contols the all the main plant such as boilers, primary pumps, VT heating pumps, VT underfloor heating pumps and CT domestic hot water pumps as well as heat recovery units, site metering and safety interlocks. The panel fascia is equipped with a Trend IQVIEW4 touch screen display which allows authorised users to view settings and adjust operational parameters with ease. The Trend BMS has a TCP/IP ethernet connection and is connected to the occupiers IT network. Authorised users can access custom designed graphics loaded into the BMS controller through the IT network to view the system and make adjustments to the system. The Trend IQ4E controllers interface with a Synapsys Modbus device to allow monitoring and control of various field Modbus devices such as electric meters and heat recovery unit. The BMS installed plays an integral role in operation of the facility and is a project Nyke Energy were proud to be involved with.